On any adventure I find there is always a crunch point, the moment where you find out whether your dreams fit the reality. A message from within your body helping you make a rational decision in the dangerous world of mountains. Not everyone hears this voice but if you can, it will help you achieve more and stay alive. This morning the alarm went off at the semi-respectable mountaineering time of four in the morning but the problem is that I’m still at home, tiptoeing around the kitchen getting the last of my food before sneaking out the door. I would like to be camping at the base of the climb but young children wanting bedtime stories and a kitchen that, if not cleaned would be quarantined and the house burnt to prevent the spread of deadly diseases, sees me spend the evening demonstrating model husband behaviour. From Arrowtown I drive over to Wanaka then up the amazingly rough road to the Matukituki, the corrugations are so bad I can only assume they are put there to entertain tourists. Once across the surprisingly deep and cold West Matukituki I head off up the East branch. It’s 6.30am and the sun has been up for more than half an hour. It’s what I like to call a “domestic alpine start”. The first neuron of the morning springs into life saying “run you lazy bugger”, the legs say “what, aren’t we just useless appendages that rest under a computer desk?” The pesky little neuron wins and soon I am running through the farmer’s paddocks up the East Matukituki, across the Glacier Burn and into the beech forest. After an hour I see a large group of trampers ahead packing up their campsite and about to walk off. The nice, modest part of me decides to slow down, walk past and maybe engage in a brief conversation, wish them well and start running again once I am out of sight. As I approach and begin to slow down that crazy little neuron screams “just keep running you flat land wimp” so I blast past hoping they don’t notice but end up yelling hellos over my shoulder as I leap from boulder to tree root on the track ahead. The legs are still working as I turn left up the Kitchener and finally make it to the junction of the Rainbow River after two hours. It’s now 8.30am and I am hoping to be rewarded by a glimpse of my prize for the day – the unclimbed south face of Mount Fastness. Instead of seeing a great dry wall of sun-warmed rock the cliffs disappear into low cloud and are regularly punctuated by a surprising number of waterfalls. Inspiration for the climb began a year ago when I was exploring around Wilmot Saddle. I had succeeded in finding what is without doubt the easiest way into the Volta Glacier. 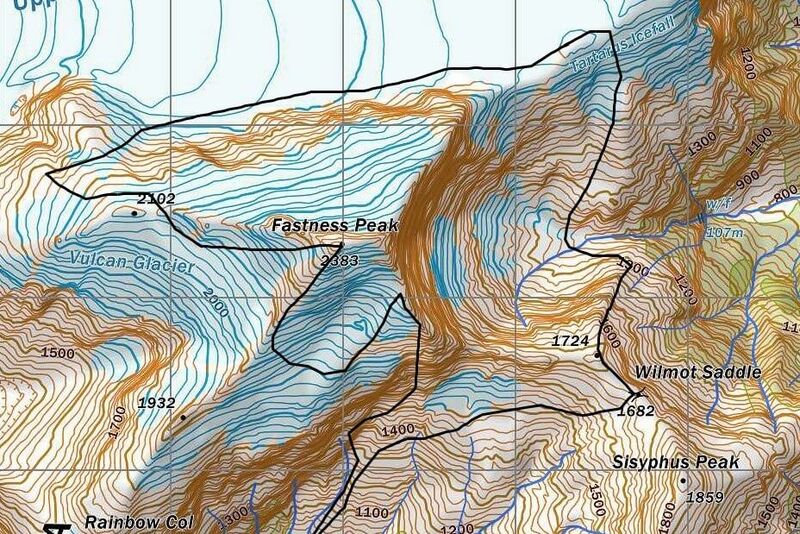 By descending the steep and scrubby ridge running north from point 1724, which is a few hundred metres northwest of the saddle, it is possible to reach the basins below the northeast face of Fastness. Then it is a straightforward climb up to the non-existent Tartarus icefall and onto the Volta. On my return I noticed a pillar of good looking rock on the south face of Fastness that could provide both good climbing and efficient access to the easier slopes below the summit. This objective is hidden from view as I continue up the Rainbow Valley and swap from my five finger running “shoes” into footwear more normally suited to climbing. I have now been going almost three hours and I know if I listen, my body is telling me whether I am up to it or not. This is no new age, whale hugging, crystal rubbing, yoghurt slurping pseudo-science going on here. What I am trying to work out is quite real. After about two and a half hours of moderately high intensity exercise my body has burnt through all the easily accessible energy stores such as glycogen stored within the muscle tissue – runners often refer to this point as “hitting the wall”. The energy I require today is probably twice as much as I will eat so my body has to start breaking down stored fat reserves and accessing the great energy warehouse of the liver. This process is complex and is not a given. From my experience, slight changes to your health such as the tail end of a cold or previous fatigue prevent this process from working efficiently. At this stage I am also getting a good idea about the state of my nervous system, whether it is recruiting and using the resources of my body well. Some days I just don’t seem to have the oomph and I notice a stretch and ache in each uphill stride, as though the muscles are just not up to the task. I know they are, it’s just that sometimes the wiring is preoccupied with managing another problem. For the last two years I have had children at preschool and every week they come home with a new variation of the bubonic plague which they pass onto me to thwart my climbing ambition. Finally there is my brain. Some “friends” question whether I have one but I’m sure it’s tucked away in some masculine part of my body somewhere. That neuron that got me to run up the valley has to live somewhere. This brain thing has sat around for the last few weeks dreaming up a big adventure and now has finally got over its initial euphoria and is facing reality. Does it really think climbing up into the waterfalls and cloud is a good idea? After several hours of solid exercise the level of the neurotransmitter dopamine have started to decrease. The original surge of chemicals that allowed me to dash out the house, get moving and made me full of excitement about the day ahead are now subsiding to more normal levels. This is where the mechanisms of the mind get somewhat convoluted. The first problem is the mind has to judge itself, so if it’s in an imperfect state it has to determine its own imperfection. The great example of this is when hypothermic, the minds lacks the ability to accurately judge itself. The fascinating thing is that your mind has the ability to change its chemical composition by what you think. Imagining enjoyable climbing, warm sunshine and positive hand-holds will increase the levels of dopamine. So I think up all the great things for the day; maybe there is some social recognition of a good climb (maybe), or if I can convince myself of sexual reward (very unlikely) for such heroic effort then my mind will be towing me up the hill! This stage is also where coffee drinkers find the going tough. Because caffeine is a stimulant that increases the production of dopamine, it got you up and going in the morning. The problem is that that was many hours ago and now you are hitting a double low, one from the normal cycle of neurotransmitters and the other from the lack of supporting drug. Unless you are prepared to give up coffee, your best bet is to keep on taking this psychoactive drug throughout the day. Today I am lucky, everything feels in good order. I don’t need to be masochistic and push myself, instead the internal dialogue is more along the lines of my conscious saying “shouldn’t I take a quick drink and bite to eat” and my body saying “just a little bit further, over the next rise, I don’t want to stop now”. Soon I am at the point where the scree, cliff and clouds all meet but I don’t have a clue where to go. I sit on a rock and wait. The odd patch of blue appears but not enough to give me much help – I’m glad I didn’t start any earlier. I am semi-confident of my location so I start climbing the rock wall into the clag. The going is terrible on damp weetbix rock. I do all those tricks that have long been forgotten by the modern generation of rock climbers; bridging moves where all holds are lose, hand jams in the gap where the soil is peeling away from the rock and the old faithful of using your fingers to dig out a hold in the loose muck. After a hundred metres I’m regretting not taking a rope to abseil down the way I have come and am optimistically hoping the rock will improve above. I press on and take a crack system which I hope will lead to some easier ground and am relieved to find it takes me to a wide gravel ledge. The visibility has improved and on arrival I realise I’m in totally the wrong part of the face. Above me is the buttress I planned to climb and to the right a ledge system that would allow me to avoid what I just climbed. Some more scrambling and I am sitting on a rock surveying my planned route. It looks fantastic and should provide the right level of adventure and difficulty when tackled in rock boots. As I rummage through my gear I hear what sounds like gunshot but when I look around there is nothing to be seen. In front of me is the sun-warmed buttress and running parallel is a huge, overhanging cliff the same height as the buttress. As I watch I suddenly see soccer ball-sized chunks of ice silently rocket off the edge of the cliff and arc through the blue sky then smash into the buttress below. It is as though the lumps of ice are launched from a high speed sluice since some have enough speed to travel completely over the buttress while other crash into it like artillery shells. What an odd situation. If you were climbing and were hit by a lump of ice you wouldn’t hear it coming and life would be over before you realised. The chance of being hit is statistical – it would follow the pattern of a Poisson distribution and is probably quite low, maybe about the same as being crashed into when driving the wrong way up a ski field road. My intuition says turn around but I linger and try and work out the real risk instead of my perception. As I look around I notice a small white speck silhouetted against the blue sky directly above me, it is another lump of ice of unknown size. I watch it free fall, have a moment of concern thinking I might have to move but am finally relieved when a fist-size ice lump smashes into the ground a few metres away. This really is a dumb place to be so I scuttle back along the ledges to safer ground and in doing so realise it’s very hard to move and look up at the sky for falling ice at the same time. As I head back towards Wilmot Pass I console myself with the thought that an ascent of Sisyphus is all the day will allow. But then I notice another possible route up the face, this one free from falling ice. The climbing isn’t steep but it is all off-angle. The bedding plane dips towards me and forms wide, out-sloping ledges, which, trusting friction, can be walked across. Between these sloping ledges are steep little rock bands typically three to four metres high. Climbing these isn’t very positive since everything slopes the wrong way. I’m not sure whether I am climbing badly or whether the reachy and bridging moves I do are the best way to tackle the terrain. The general pattern for the climb is to zigzag along the sloping ledges until a route is found through the next band of low cliffs then continue and repeat a dozen or so times. After a couple of hours I cross some mixed snow and rock then finally join the east ridge of Fastness. From here I had hoped for an easy snow plod to the summit but on cresting the shoulder of the mountain at 2120 metres realise that the glacier on the east of Fastness is a mean wee thing. It is a shallow glacier with only two or three years of snow accumulation that slides on the flat schist rock and forms crevasses not so much by bending but more by pulling apart as it slides over the rock. Where the glacier meets the ridge is a jumble of crevasses that look too much to tackle without a rope and a friend. To avoid these troubles I drop down several hundred vertical metres then grind up through knee deep snow to the summit of Fastness. The view takes my breath away. I have often noticed that the best view is not from the highest mountain but the one that offers the best perspective. Fastness fits this criteria perfectly. To the southwest is the towering bulk of Mount Aspiring draped with its heavy glaciers and culminating in the jagged coxcomb ridge running towards Popes Nose. On the other side is the wide Volta Glacier which is held in by the rounded Glacier Dome and the pointy Mt Pickelhaube. Further to the north are Castor and Pollux keeping watch over the Wilkin Valley then in the far distance Mount Brewster and Mount Cook. To the east are the Matukituki and Rainbow valleys, drenched in green forest and meandering their way to the sea. It is now 6pm and no matter how optimistically I look at it I have at least six more hours of travel to get home. Fortunately I have some footsteps to follow; I encouraged some friends to climb Fastness via my planned descent route of Wilmot saddle and it appears they were up here either yesterday or this morning. I follow their steps down to the Volta where a hard surface allow me to walk briskly to Tartarus Icefall. The icefall has disappeared a few decades ago and what remains is an easy descent into the basins below Fastness at the head of Ruth Stream. The secret to the route is to start the descent about half a kilometre north of the low point in the ridge. Below the imposing east face of Fastness I start the final climb of the day. It is now 8.30pm, the shadows are getting long and the cloak of darkness not far away. When I add up the various ups and downs of the day I have probably already climbed almost 3000 vertical metres. It’s an interesting exercise in developing the motivation and energy to keep pushing on. I break the next five hours down into stages and see a positive achievement in each stage and also accept how I will feel in each of those stages. The 500 metre climb up to Wilmot Pass is easier than expected which is encouraging – nothing like setting yourself low expectations! My torch seems dim as I descend below the pass so I replace the batteries but an hour or so later as I walk down the Rainbow Valley these again seem dim. The replacement pair are not quite fully-charged rechargeables and don’t seem up to the task. There is no moon and soon the torch is so dim I’m struggling to work out how to cross the snowmelt-filled streams. The final straw is crossing the Kitchener, stumbling in waist deep and the torch being so dim that I can’t see the other side. It always amazes me how cold you get sleeping under the stars with no bivi gear. When walking I had just a merino t-shirt on and now I’m wearing all my clothes and shivering. After being woken by a rude possum I remember something about trees being warmer so find some undergrowth and crawl in. And, yes, it is warmer. The sun is catching the tops as the sandflies wake me the next morning. I start walking and enjoy the gentle sounds of the streams and river. As I cross the Glacier Burn and start walking through the farm land that pesky neuron fires up again and says “run you slacker”. I try – my legs feel heavy and lack spring but I trot along. By mid-morning I am back at the car and refreshing myself with a cool swim in the river. It is a picture-perfect day and wonderful to relax, look at the mountains and enjoy the feeling of a good climb achieved with speed and efficiency. To me climbing is not so much about iron will and determination but more about fitting who you are and your state on a particular day with a realistic goal. I am always intrigued about the inner workings of body and mind and how they allow you to succeed and come home safely. As for that pesky neuron that kept wanting me to run, well, I shouldn’t complain since I think it is the same part of my brain that turns dreamy ideas into reality.